Stinking Thinking regarding various winged space plane concepts will prove to be impractical. The entire concept of a winged space plane, Mini Space Shuttle, SSTO, Boeing x-51, X-43, Syklon is based on the illogical premise that wings will make a spaceplane more reusable and more cost effective. It is easy to disprove the premise that space plane concepts will be more cost effective. It is a simple fact of physics that the lighter and less air-drag a spacecraft encompasses the less energy it will require to launch it into space. Wings add considerable weight and air-drag on the way to space and make the launch less efficient. RUNWAY TAKEOFF: Provisions for a runway takeoff of a space plane are wasteful. Whatever system brings us up to ramjet speed and altitude should not also be carried into space. We don’t need wheels and turbojets to be carried into space where they serve no purpose. Most everything that gets carried all the way into space, should be needed while in space. WINGS: Wings are entirely unnecessary on a high thrust-to-weight vehicle that is rapidly accelerating into space. All they do is add weight and drag. Wings are “in-the-way” at 10,000 miles per hour. They serve no purpose in space. If you think you need wings, speed up! RUNWAY LANDING: There seems to be a misguided belief that landing like an airplane will make the space plane more reusable. The true requirement is to return to earth safely and in a manner that allows the spacecraft to be economically reused again in a short period of time. This requirement absolutely does not imply the need to land like an airplane. It is a ridiculous argument that designing a spacecraft to look and function like an airplane will make it more economical or efficient. Such an illogical leap is not good science. It is just popular pseudoscience. It’s a pre-conceived solution pushing design decisions instead of good science based engineering searching for a solution. In order to believe the pseudoscience that adding wings to a spacecraft will make it more efficient, you must ignore the hard facts that the winged Space Shuttle cost three times more per pound to place objects in orbit than other methods. The key is that “simplest” is usually the best design approach. The less there is to go wrong; the less chance something will go wrong. There is no need to carry wheels, wings, turbojets, larger aerodynamic control surfaces and large hydraulic systems into space. Let’s leave them behind on Earth and thus build a more reliable, safer and more practical spacecraft. The most efficient space launch system will be the one that carries less weight and unneeded equipment all the way into space. A single stage to orbit system that carries unneeded stuff into space will always be less efficient than a system that “stages” its way into space leaving unnecessary stuff behind. The book ���What If We Made Space Travel Practical?” proposes solutions that are practical and based on true science not pseudoscience. 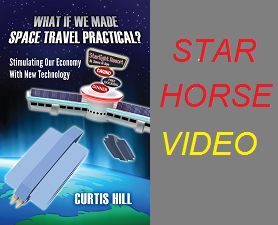 The book demonstrates how we can reduce the cost of space travel by 95 percent.